1. Cut out front section of the tub: To begin with, start by outlining edge of the front section. Now cut out the outlined section using an angle 4.5-inch cutter wheel. It can put strains on the iron, so work very carefully. 2. Clean the surface of the bathtub: Sand down any rusted areas, and completely clean the cast iron tub inside out prior to painting. 3. Apply some vibrant paint: Add lively touch to your sofa by applying vibrant paint onto the tub. Here cherry red paint is used, but you can use any other paint of your choice. 4. Air dry the paint: Let the paint air dry completely so that the remains don’t stick on the cushions or your clothes. 5. 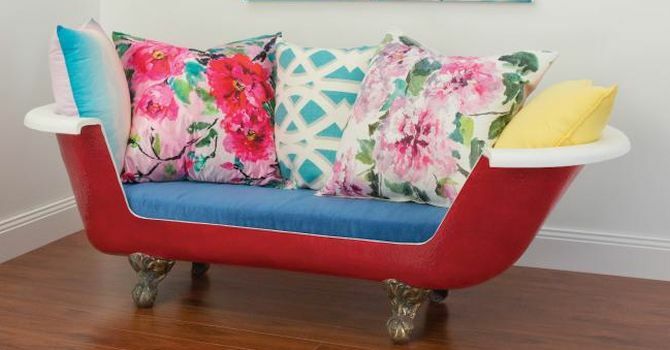 Add fun and colorful cushions: Add some funky colorful cushions to make the sofa comfortable. Preferably, use contrasting floral or bright cushions covers to spruce up appearance of this conversational piece of furniture. Finally, your eclectic bathtub sofa is all-set to make any indoor or outdoor space look more appealing. So if you’ve got any old bathtub lying in your backyard store, then you know how to put in into practical use. Spare a thought about the DIY upcycled bathtub sofa. If you know some other creative ways to turn ordinary bathtubs into something decorative and functional at the same time, do share your ideas with us.